A Promaster with a height extension so there are double cabinets around the top and just for IB.... wait.for.it..... double jacknife couches in the back that convert!!!!! The downsides are that it looks like you would likely have to sleep crosswise since the bed length is shorter than the T1Ns (53x73 versus 70x76 in the T1N), and the additional height did not go into the bathroom... But for a very tall person, the standing height is 7'4". Humble Road also had some quick walkthroughs of a Promaster and a Sprinter, but the Promaster George showed was the traditional sofa. the Promaster George showed was the traditional sofa. Passed a Promaster-based B yesterday. I didn't catch who the manufacturer was. I think the Promaster is unbearably ugly. I would even choose a Ford Transit-based rig over the Promaster, although I find the Ford grille very ugly. Ford quite obviously made a Chinese copy of the Sprinter and then ruined it with an ugly grille. BUGSBUNNY - This definitely would appeal to tall customers. Enjoyed the vid. I did not like the part where they somehow limited the bath height to still under 6ft. Not sure what limits that height? I owned a van conversion in the early 90's and it also had a fiberglass raised cap. I hope the technology has gotten better on these caps, i.e. addressing leaks. It would've been nice if the high roof came from factory, i.e like the MB Super High Roof, not fiberglass. But even MB is no longer offering the Super High Roof option. Being a short person 5'5", I have no need for the extra height. But 3 of my taller 5-footer friends who are 5'16" and 5'17" still have to duck in my van They would love this. The bed length would not be ideal for them. Regency has been doing their market research. They're in Fort Worth, and I wonder if they've been looking at any local vanners for inspiration. I haven't been the only one to point out the jackknife market hole. That thing is obviously aimed at tall people but also those who have kids. With those dimensions, some clever bugger is going to figure out how to add kids' beds vertically. I am under 5.5 and hubby is about 6, so our Sprinter is great. The guy that bought our 345 Classic MH was 6'4". One of the appeals of the classic was the high roof line in it for him and the first thing he said when he came to look at it. Not sure how this would do in the wind either, but it is good to have options and may just be the right thing for some. The Promaster for us is out because of the lack of 4x4, and we just like the Sprinter better. We really like our T1N and can't see switching to anything else at this point other than a 4x4 Sprinter - and that would be very unlikely due to our style of camping at this point. I have avoided posting the substantial interim blah blah blah about Roadtrek, but they went down entirely yesterday. All employees fired and the plant locked out. With Roadtrek gone, that takes out about a quarter of the herd. Wonder how other class b manufacturers will fill the gap? It could impede innovation as they work overtime to increase production. And that's not good for quality. ROWIEBOWIE - Because it's an icon in the industry, it’s still a valued asset. In theory, if the receivership is done right, it may be spun off to another buyer & may even keep it's name (or under a different name if they feel the name carries a stigma). My feeling is it will resurface somewhere, somehow, & not completely disappear. I would be pleased if you are right. But the Roadtrek topic has been thoroughly discussed for nearly a month over at classbforum and every dire prediction has come true, if not more dire than first thought. It seems now it is to the point where the brand name might survive, but not as anything resembling the current Roadtrek. I hope I'm wrong. I find it interesting that Thor Industries bought the world wide corporation but excluded the North American operations due to issues of Roadtrek mismanagement. That is one way to eliminate the competition, buy-em and/or let them mismanage themselves into infinity(or jail). Thor is probably not unhappy about the way things worked out. But financial irregularities were discovered during the due diligence acquisition audit, so it looks like Thor initially intended to purchase and operate EHGNA (includes Roadtrek). Thor may, however, had plans (as you suggest) to consolidate their many lines of trailers and class b's to eliminate competition. We'll never know for sure. I dunno. The stories coming out from people who have been caught up in this thing are pretty awful -- and they are just going to keep coming, especially going forward as buyers cannot make warranty claims. It might open up more market opportunity for Thor in the long run, but in the short term, I wonder how many customers are going to hesitate for thinking that Thor might be paint-able with much the same brush. Like, is there something that makes Class B manufacturing disproportionately subject to risk or fraud. To say the same thing a slightly different way, some events do more to undermine overall consumer confidence than to bolster any given brand. My Instagram post from the other day, which was accompanied by the question, "Do you think this is worth the paper it's written on now?" 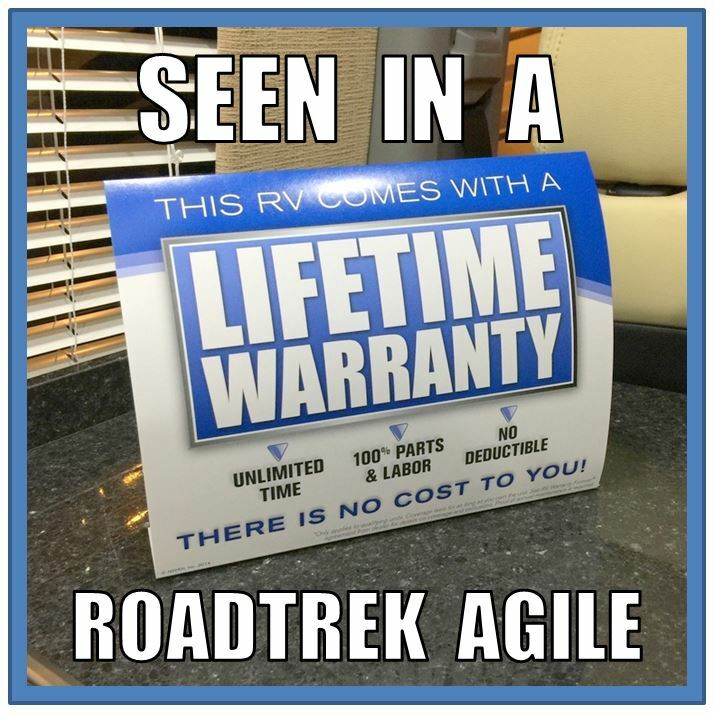 (This RV show sign was announcing a dealer's warranty to supplement RoadTrek's standard warranty). Anyone looking for Interstate alternatives should research the 2019 Coachman Galleria. Many standard features that hopefully Airstream will copy. Pro Air standard is a deal changer. Just waiting for Airstream to respond. Putting in 4 AGMs took too long. Lithium option could be years away.